This article begins with questions of an ontological and epistemological nature. Does a person think independently? Are we the authors of our thoughts. How can we know? 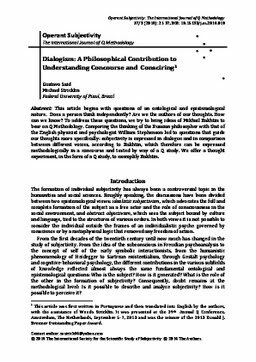 To address these questions, we try to bring ideas of Mikhail Bakhtin to bear on Q Methodology. Comparing the thinking of the Russian philosopher with that of the English physicist and psychologist William Stephenson led to questions that guide our thoughts more specifically: subjectivity is expressed in dialogue and in comparison between different voices, according to Bakhtin, which therefore can be expressed methodologically in a concourse and tested by way of a Q study. We offer a thought experiment, in the form of a Q study, to exemplify Bakhtin.